My blogging friend, Emily (a former employee and a great editor), knows my taste in literature, knows I hail from NYC and that I have two sons, so as we left Florida she sent me a summer read, a present for “Father’s Day.” We have often joked that she is my ersatz daughter and we regularly stay in touch. Sadly, and only very recently, Emily’s own father passed away. She was very close to him and I send Emily my deepest condolences. The book she kindly sent, & Sons, is by another talented “youngish” American writer, David Gilbert. It is encouraging to see a wave of emerging American writers. I think of such authors I have mentioned in this blog, Jonathan Franzan, Jonathan Tropper, Brady Udall, Eric Puchner, Jonathan Lethem, Chad Harbach, Dave King, and Jess Walker, and perhaps I’m leaving a few out. Who will replace our Updikes and Cheevers, and now Roth who (if I might borrow a baseball metaphor) has hung ‘em up as has Mariano Rivera and now Derek Jeter is about to do? Then there are the well established (no longer “youngish”) writers such as John Irving, Richard Ford, Louis Begley, Richard Russo, and Anne Tyler (probably left many others out of that list as well). I’ll read anything they write, but we need to support our emerging American authors as well. So I was happy to read a David Gilbert novel, an author of consequence. 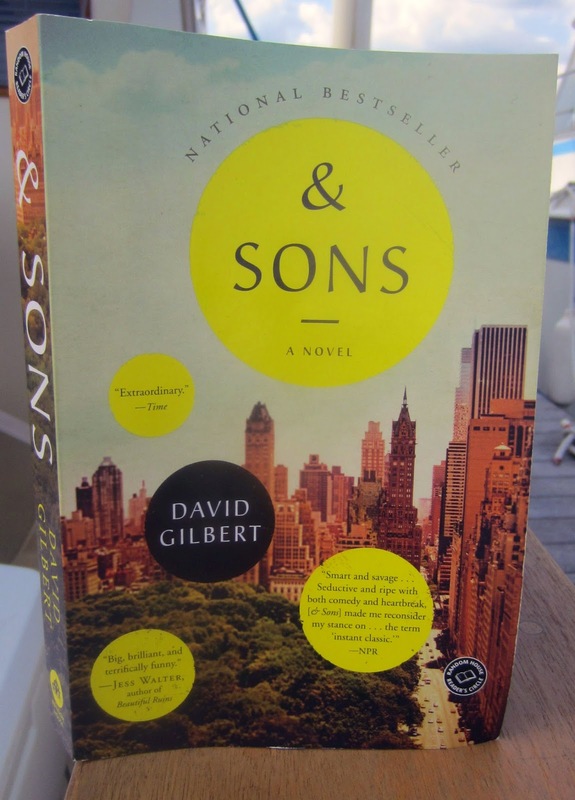 Gilbert’s &Sons is Dickenesque in its plot and subplots, Irvingesque in the characters eccentricities, and thematically one can sense the shadow of his contemporary, Jonathan Franzen dealing with family issues. I could also throw in a little Tom Wolfe and the influence of the great Canadian short story writer, Alice Munro. This doesn’t mean Gilbert isn’t original, but all writers have their progenitors. The writing is a hat tip to Salinger as well. The novel within this novel, Ampersand, was written by our protagonist, the reclusive writer A.N.Dyer. Ampersand’s mystique is similar to The Catcher in the Rye. I found the first third of the novel slow to get going, but once it does, it becomes a fast, compulsive read. Gilbert leans on a slightly science fiction like detail (if you believe A.D. Dyer’s tale to his family) to turn the corner in the novel. These criticisms are not to diminish the quality of Gilbert’s writing, which puts him in the running for one of the finer upcoming American authors. It is a complicated novel, but constructed with care and some of the writing is, well, breathtaking. As usual, I take the liberty to quote some passages, ones that appeal to me for various reasons. This passage about friends resonates from my perspective as a septuagenarian. Much of the novel is about the decline during those years. By the 70’s one feels the weight, both physically and metaphysically. I continue the journey with, alas, a diminishing number of friends… Our oldest friends, their faces, never really change as we both travel at the same speed of life. Parents and children are different. They help us measure our existence like the clock on the wall or the watch on our wrist. But all friends carry with them a braided constant, part and hole, all the days in the calendar contained in a glance. I like Gilbert’s description of the divergence of the roles of mothers and fathers, a common theme in literature and theatre…. I remember summer beach picnics organized by the Dyer and Topping women, the mothers curating our good cheer; Isabel took the photographs as Eleanor posed the players, the two of them hoping that these happy pictures might stand in for how we looked back, a prefabricated nostalgia. If fathers are unknowable, then mothers are all too visible, a reminder of our earthly attachments. Might Gilbert share some of A.D. Dyer’s feelings about the writing process? After all, writing is work. Gilbert took six years to write & Sons: The irony I would like to communicate to you boys is the fact that I never enjoyed writing very much. Oh, maybe I enjoyed the moments before writing, the thinking about writing, when the story starts to form around its cagey heart, a word an image, like with bodysurfing: in a flash I know everything, the themes, the metaphors, five of the characters, the setting, the time frame, the beginning, the middle, the end. It's a strange kind of fission, with a single atom of imagination radiates all this energy, splitting and splitting and splitting, endlessly splitting until you get Bodysurfing or The Bodysurfer which is probably better if perhaps bumping elbows with Cheever. But then you have to write the goddamn thing and it's Chernobyl. Two headed cows. Terrible birth defects. And I'm not being glib here. I'm not playing a role, despite resemblance to actual persons living or dead. I will grant you moments of satisfaction in the process, that this mess might make sense after all, that a random piece of filler, say the detail of an airplane flying overhead might beget a man parachuting down to earth. Yes there are moments. But it's not joy, just relief that the disappointment is manageable. Having been a publisher all my life, I can attest to the veracity of Gilbert’s description of a publisher’s party to introduce a new author. I’ve been to a few, although my kind of publishing – professional and academic – did not lend itself (thankfully) to a steady diet of these – they were the norm in trade publishing and I suppose they still are… These were the people who worked in publishing: the editors, the publicists, the marketers, the agents, all of whom arrived on time if almost early, not just because this was a work event but because this promised to be a rare work event that reminded them of when their industry burned bright in the New York sky, a place of true atmosphere instead of greenhouse gases. The excellent catering was also a draw. Dinner tonight came in a dozen bites. These people generally clustered in small groups mainly so they could gorge without embarrassment -- oh my God, the artichoke hearts with veal and ricotta is not of this world -- but also so they could rain down sulfur on the contemptible around them, right out of Trollope or Balzac, they might mutter, gesturing with herbed cheese straws.